The Pulz CSX 5 Cinema Surround Speaker System is ultra small in size and is designed to re..
We are one of the leading organization engaged in supplying excellent quality Electro Voice Power Speakers in Mohali, Punjab, India, which are manufactured by using high grade material. These Electro Voice Power Speakers are widely appreciated by our clients which are situated all round the nation. High in demand, these Electro Voice Power Speakers are available at most reasonable prices. 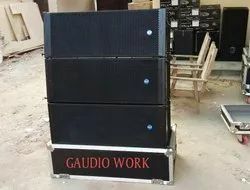 We are engaged in manufacturing LA Monitor Speaker System. These include 15" inch speaker and horn. It is the perfect solution to any need where significant extension of high frequency output is required.